The swirling silver and red that make up the shapes of these door hangers evoke the appeal of peppermint candy canes in fun holiday shapes. The door hangers come complete with jingle bells, giant red bows, pine needles, pine cones and berries. Set of 3 door hangers, each 14". The swirling silver and red that make up the shapes of these door hangers evoke the appeal of peppermint candy canes in fun holiday shapes. 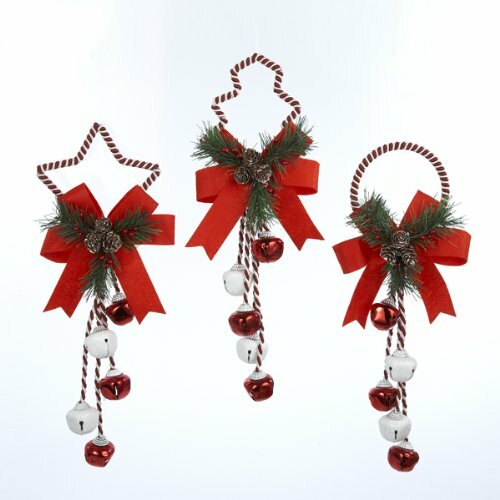 The door hangers come complete with jingle bells, giant red bows, pine needles, pine cones and berries. Set of 3 door hangers, each 14".